THE WEST GREAT ROOM HAS A FRONT ROW VIEW OF THE CRYSTAL CLEAR WATERS OF LAKE SUPERIOR AND AU TRAIN ISLAND. 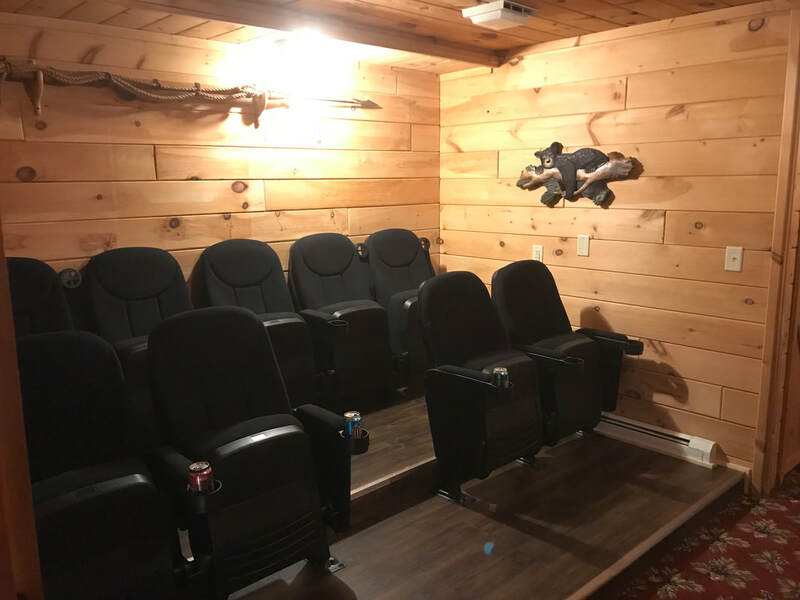 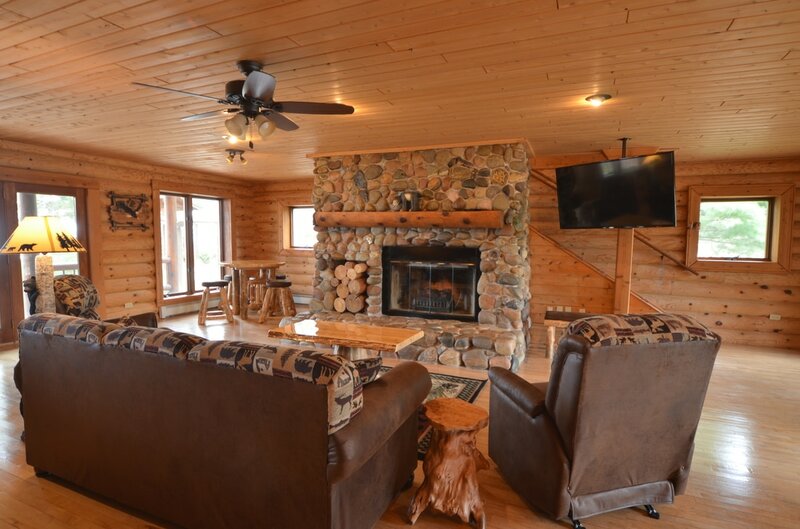 ENJOY THE BEAUTY OF THE LOG STRUCTURE OF THE HOME DECORATED WITH CUSTOM LOG FURNITURE, INCLUDING A STUMP BASE COFFEE AND END TABLES, A FIREPLACE AND FLAT SCREEN SMART TV EQUIPPED WITH DISH TV AND WIFI. 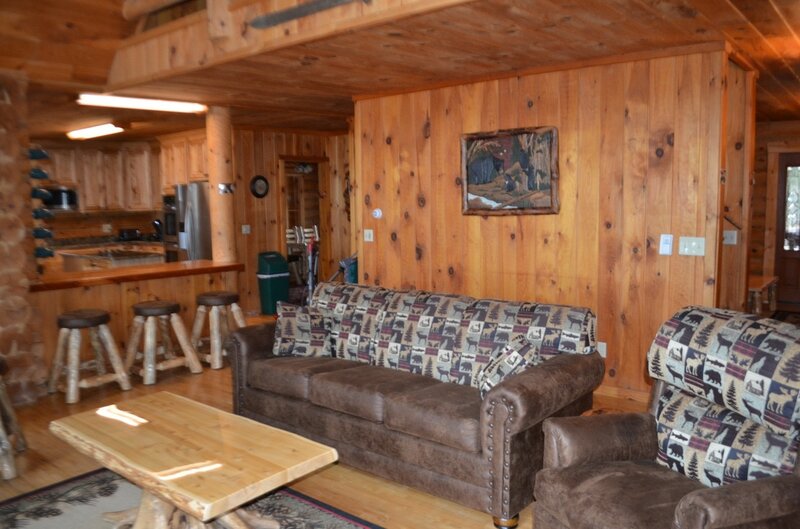 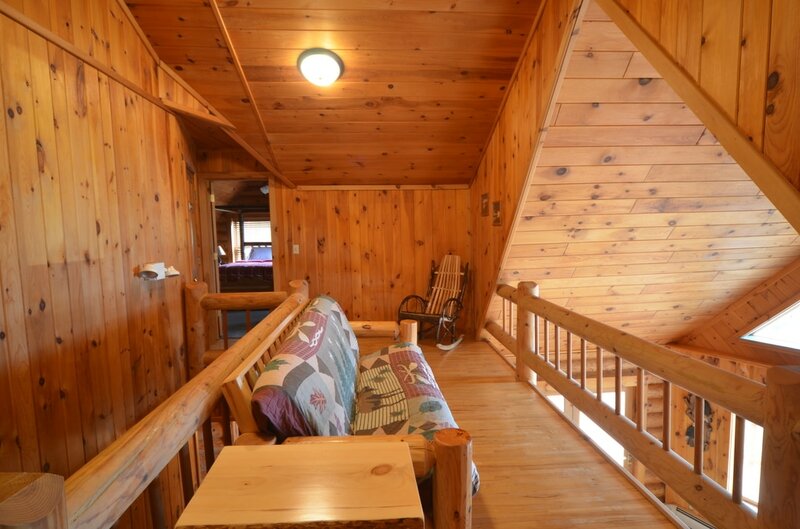 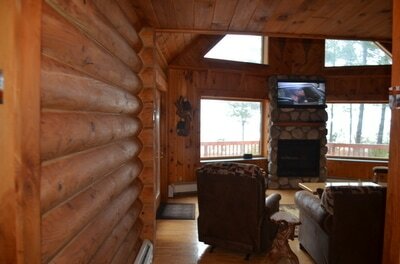 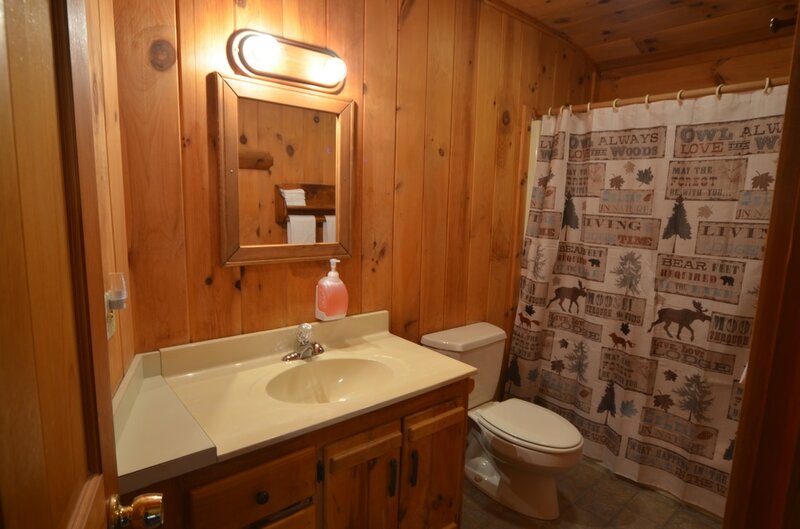 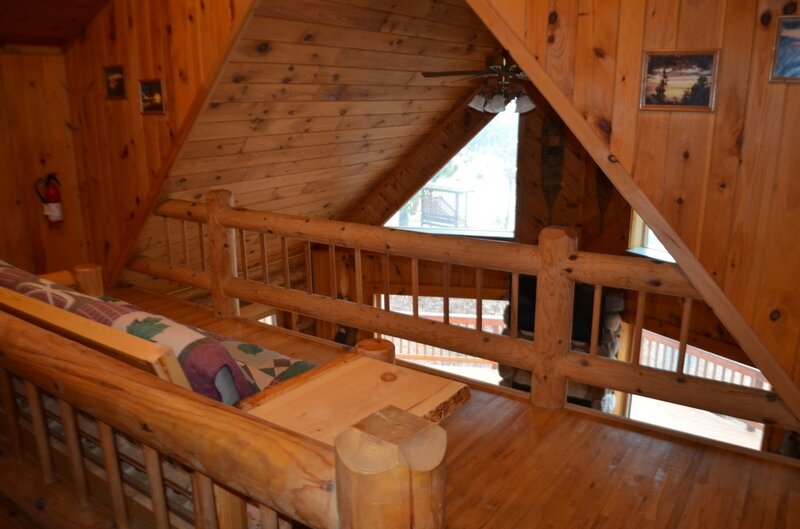 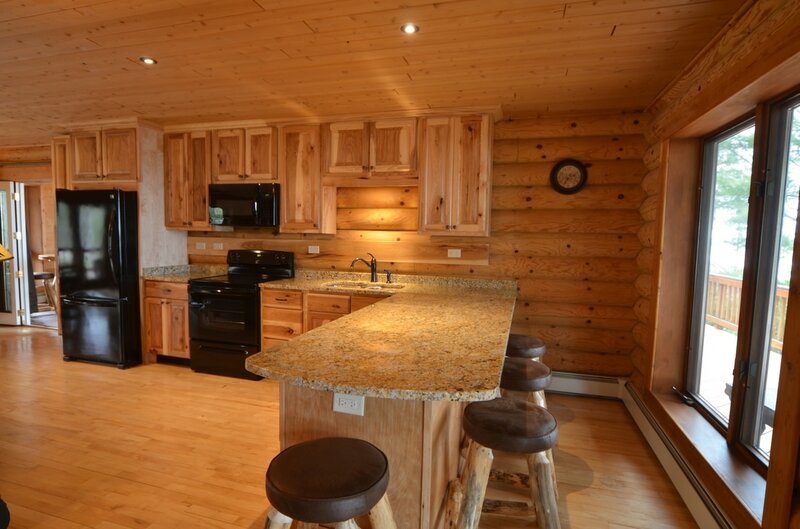 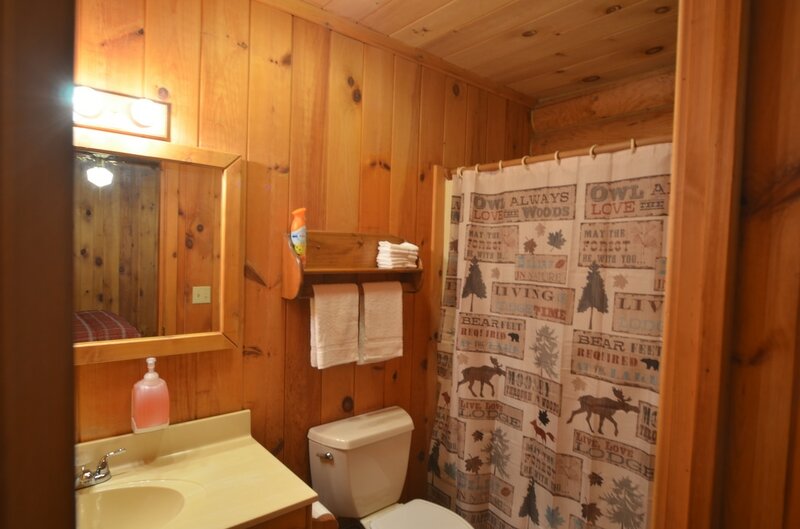 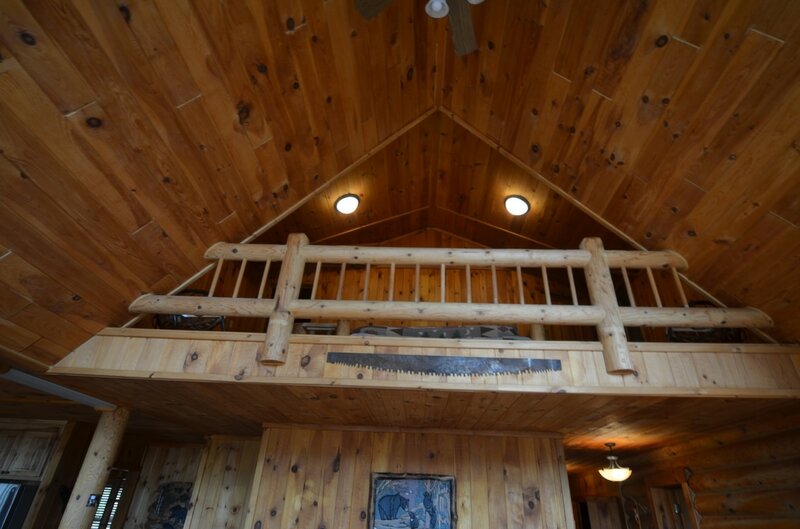 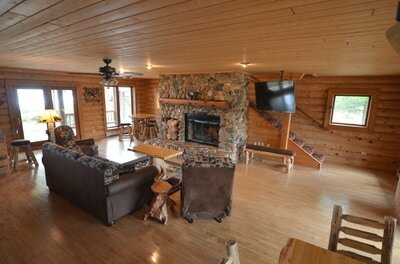 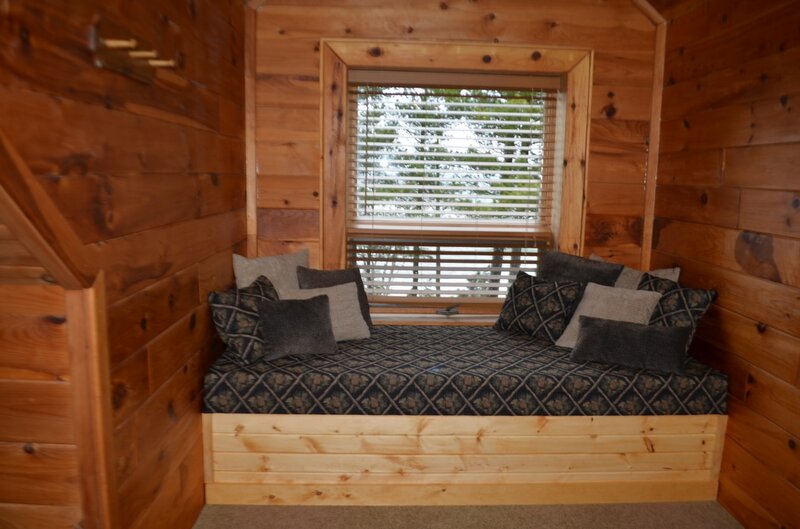 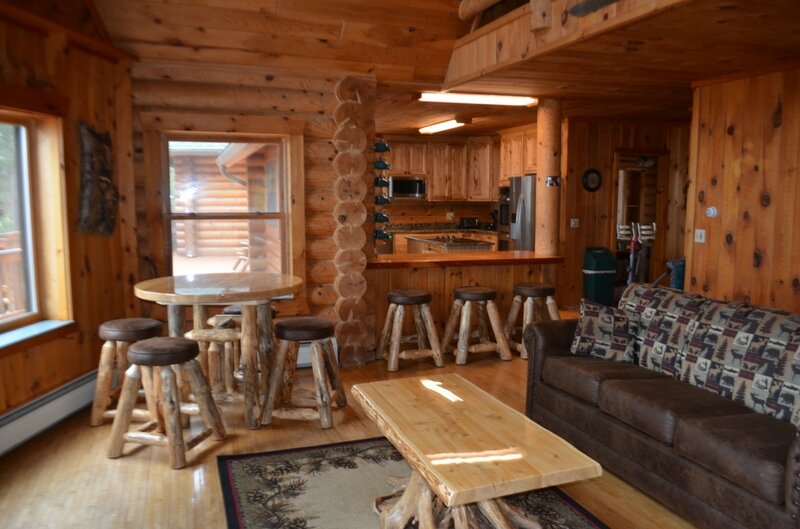 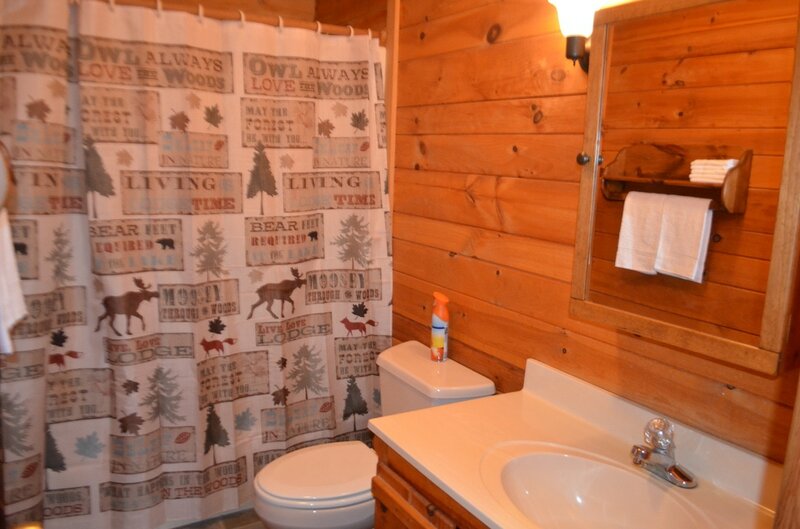 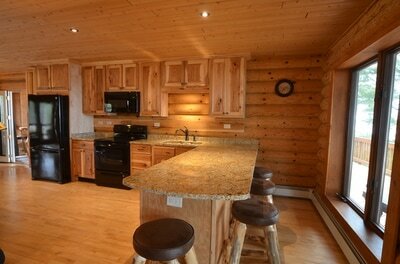 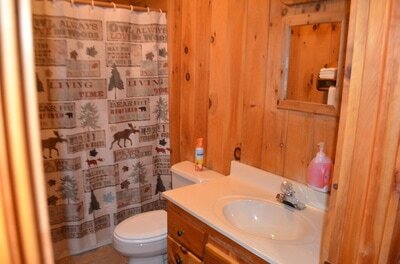 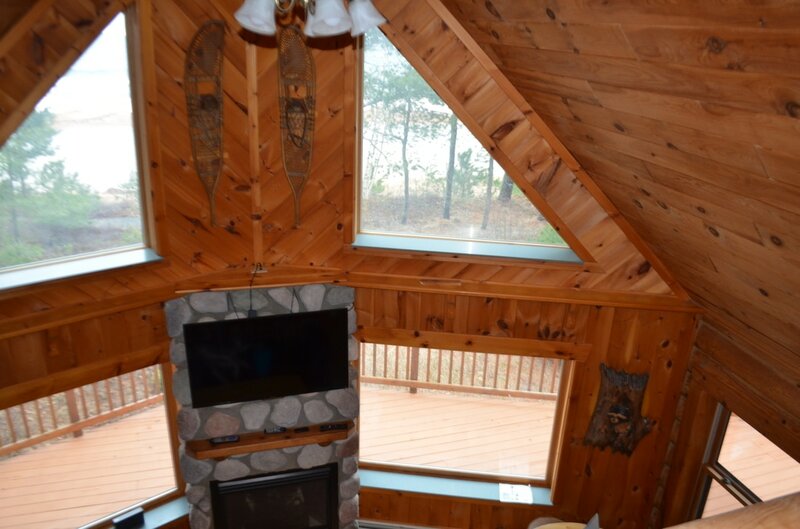 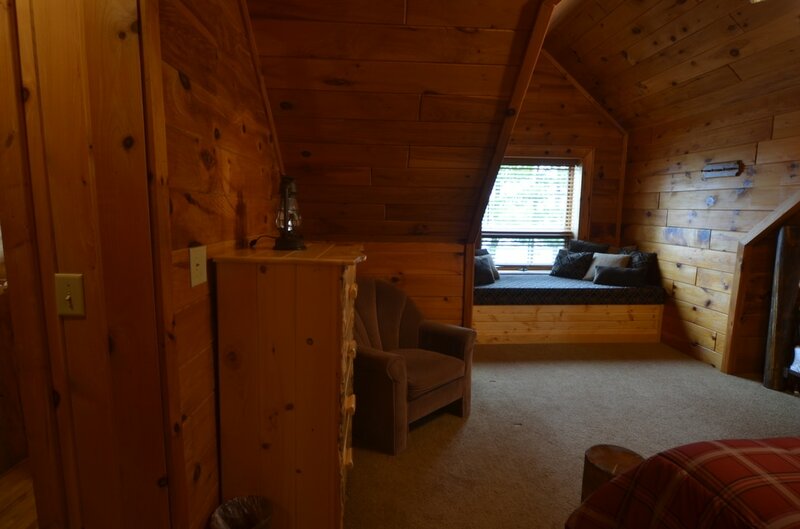 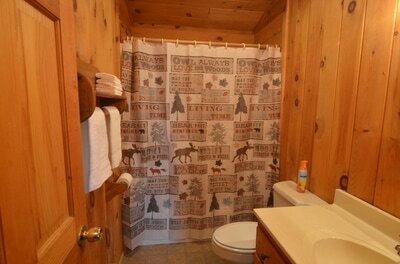 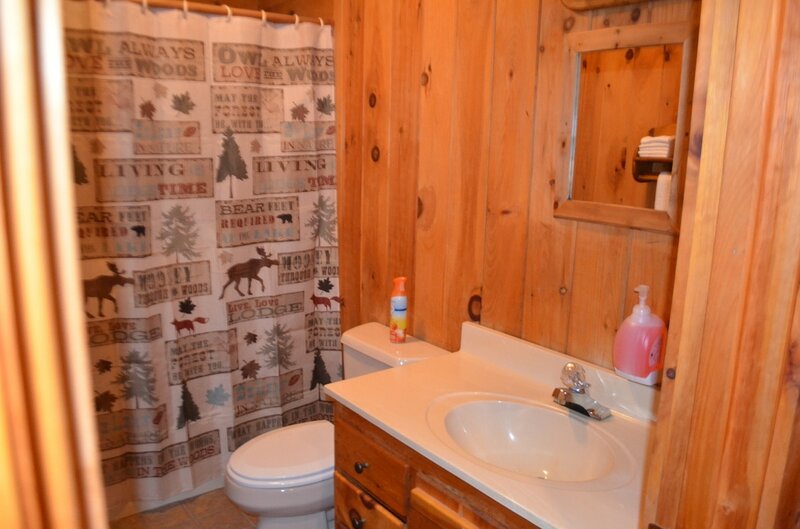 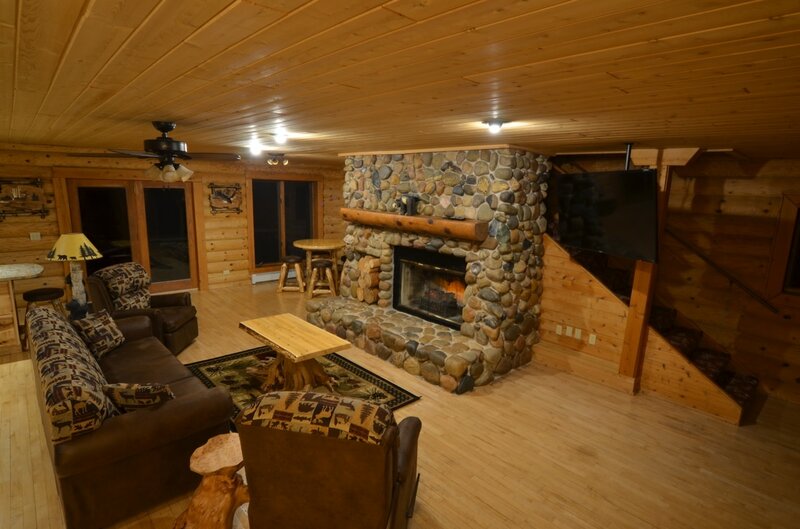 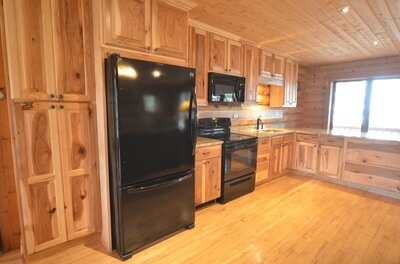 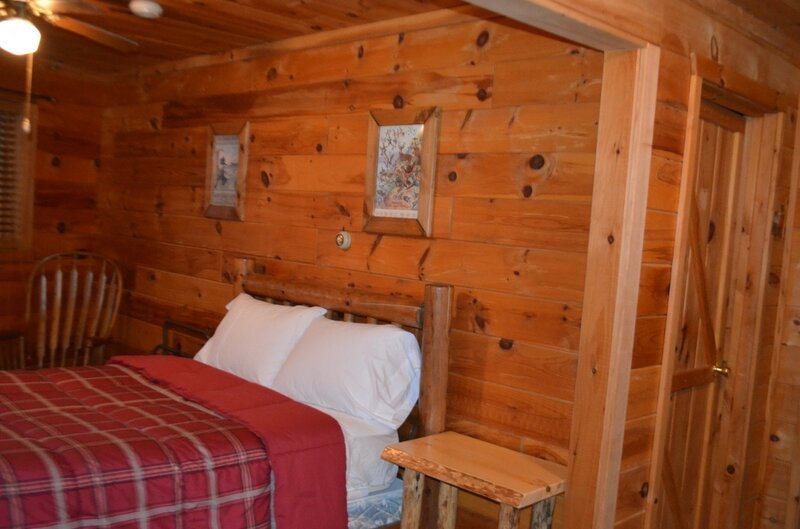 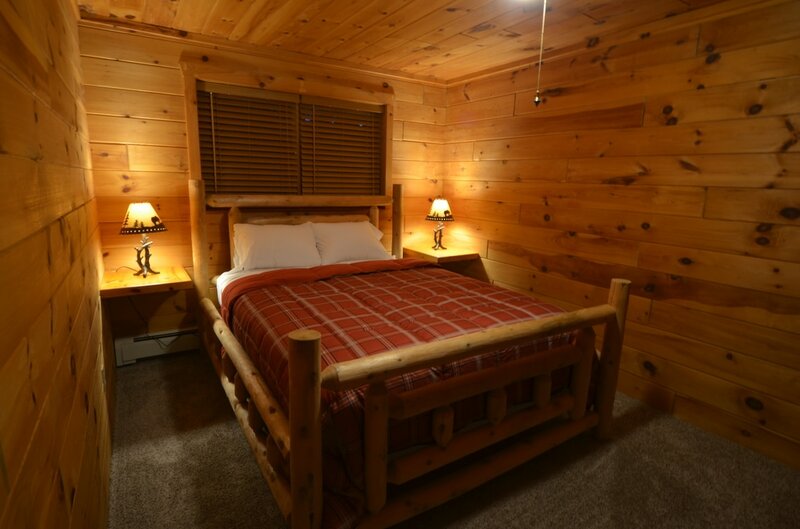 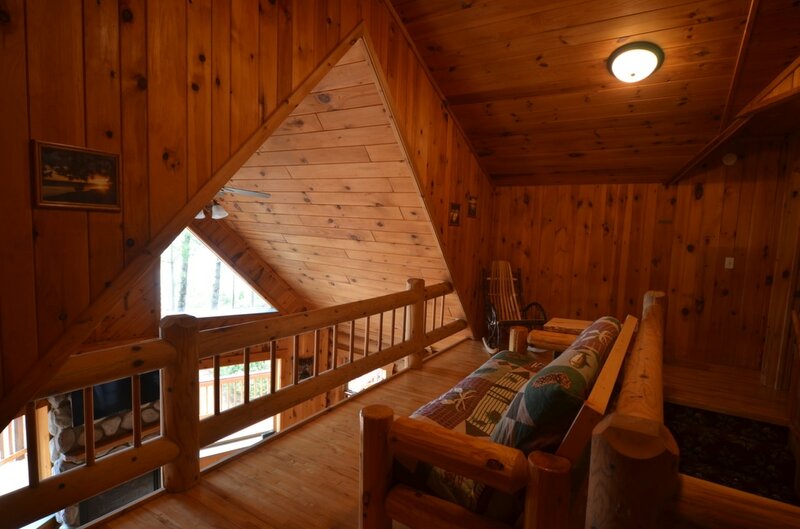 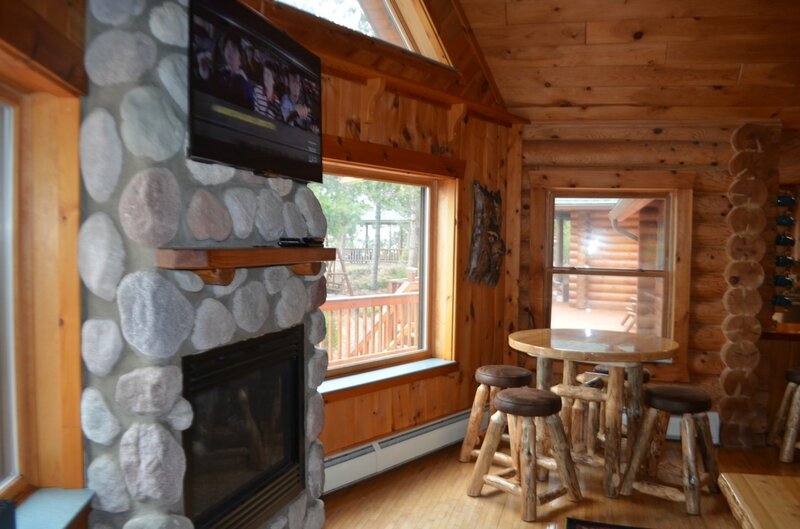 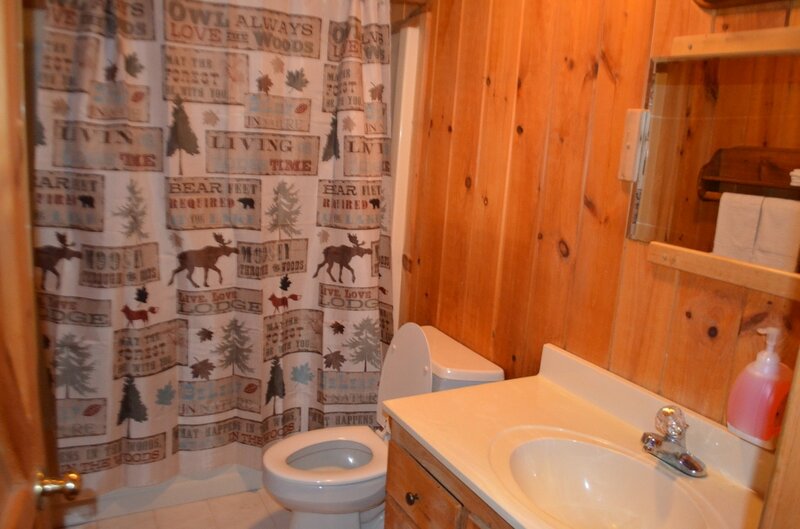 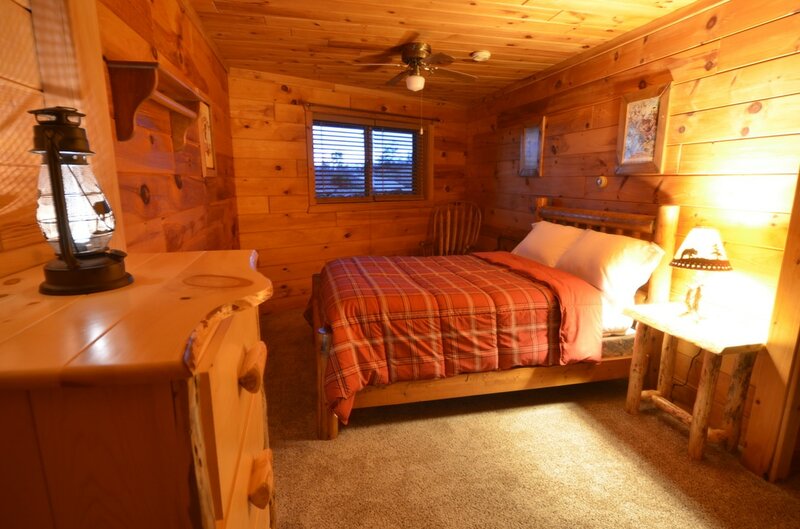 ALL THE COMFORTS OF HOME IN A COZY CABIN ATMOSPHERE. OVERLOOKING THE BEAUTIFUL WEST GREAT ROOM IS A BALCONY LOCATED ON THE UPPER LEVEL OF THE WEST END OF THE LODGE. 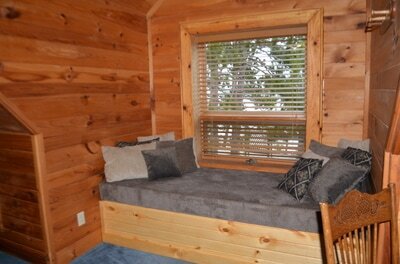 THIS SITTING AREA IS A FAVORITE FOR MANY AS IT IS DIRECTLY ACROSS FROM THE BIG WINDOWS LOOKING OUT TO LAKE SUPERIOR. THE BALCONY IS CENTRALLY LOCATED BETWEEN BEDROOMS 1,2 & 3. 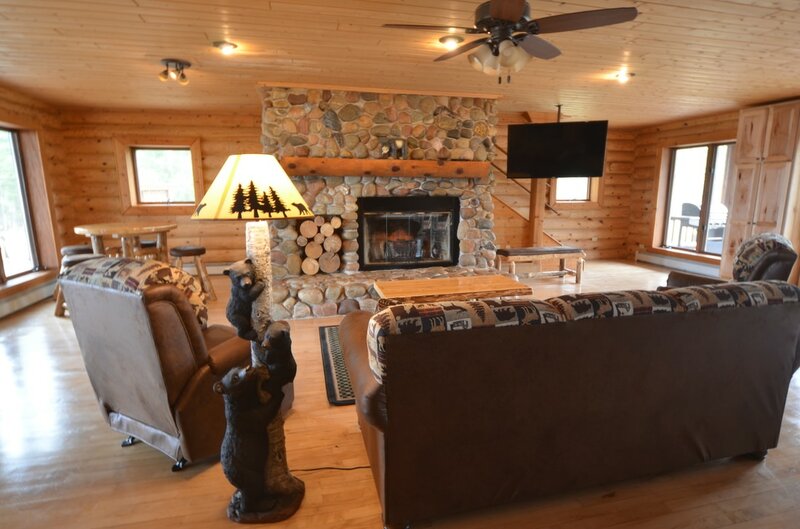 THE EAST GREAT ROOM'S FOCAL POINT IS THE BEAUTIFUL FIREPLACE CONSTRUCTED OF MOSTLY ROCKS FROM LAKE SUPERIOR AS WELL AS SOME QUARTZ, HEMATITE, AGATE AND MANY OTHER BEAUTIFUL SPECIMENS FROM AROUND THE AREA. THE FRONT DOOR OF THE EAST GREAT ROOM LEADS OUT TO A SPAN OF DECK THAT COVERS THE ENTIRE LENGTH OF THE LODGE. 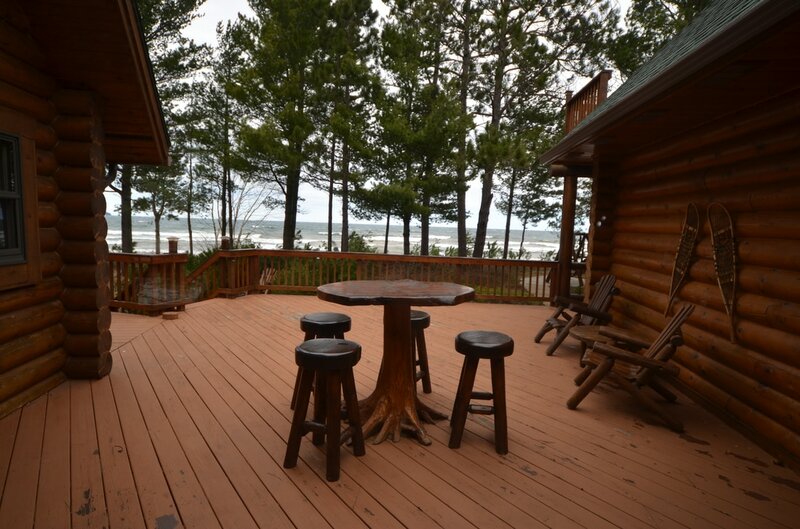 OUT THE BACK DOOR YOU WALK OUT TO OUR BEAUTIFUL TRELLIS WALKWAY AND GAZEBO THAT OVERHANGS THE SAND BEACH OF LAKE SUPERIOR AND A BOARDWALK THAT ADVENTURES AROUND THE PROPERTY TO PRIVATE SEATING AREAS AND WALKING PATHS. 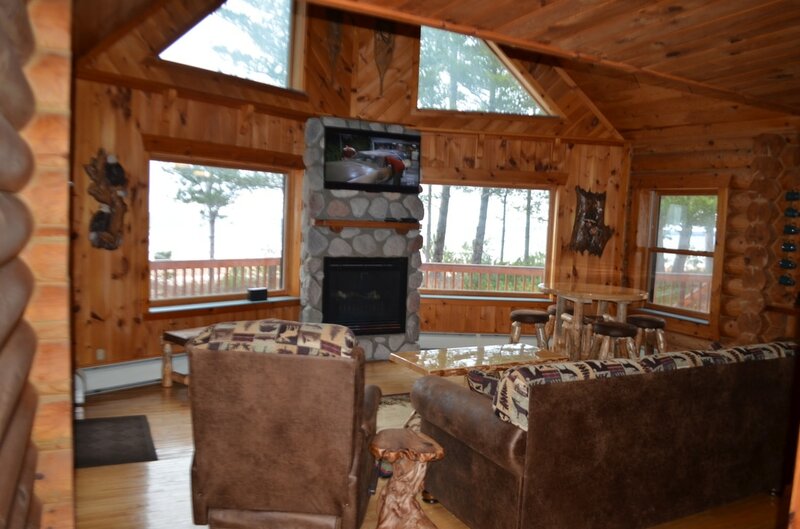 LIKE THE WEST GREAT ROOM THIS ROOM IS CLEANLY DECORATED WITH MODERN RUSTIC FURNITURE, A 55" FLAT SCREEN SMART TV EQUIPPED WITH WIFI, AND DISH TV. THE KITCHEN ON THE WEST SIDE IS A FULLY STOCKED KITCHEN, WITH ALL NEW APPLIANCES INCLUDING A DISHWASHER, DUAL OVENS, ELECTRIC STOVE TOP, A LARGE REFRIGERATOR/FREEZER WITH ICE AND FILTERED WATER. 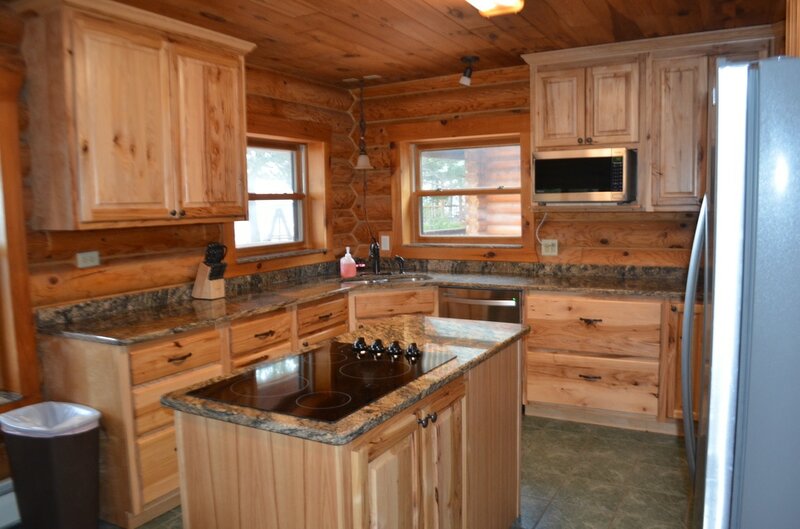 GRANITE COUNTER TOPS AND ALL THE COOKWARE YOU NEED TO MAKE YOUR FAVORITE MEALS IS SUPPLIED, WE EVEN PROVIDE BASIC CONDIMENTS AND SPICES. THE EAST KITCHEN IS COMPLETELY NEW. 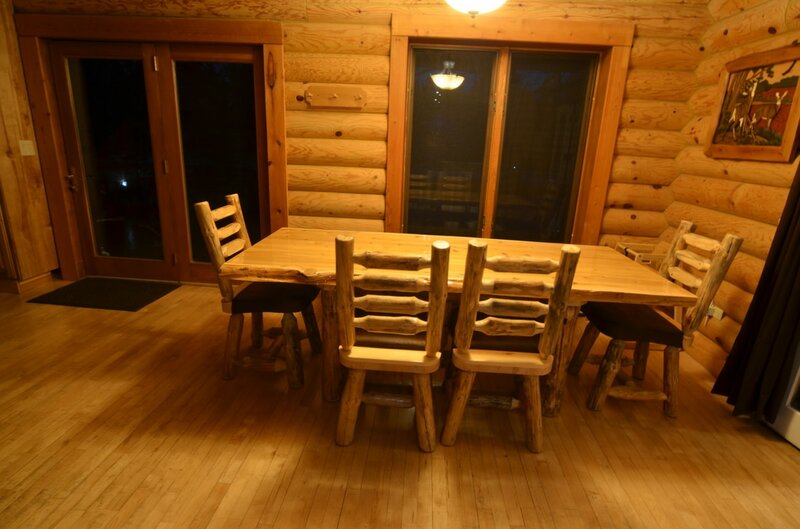 THIS LARGE ROOM WAS FORMALLY A GREAT ROOM ONLY, BUT DUE TO THE NUMBER OF PEOPLE THE LODGE ACCOMMODATES, WE FELT THERE NEEDED TO BE A SECOND KITCHEN. 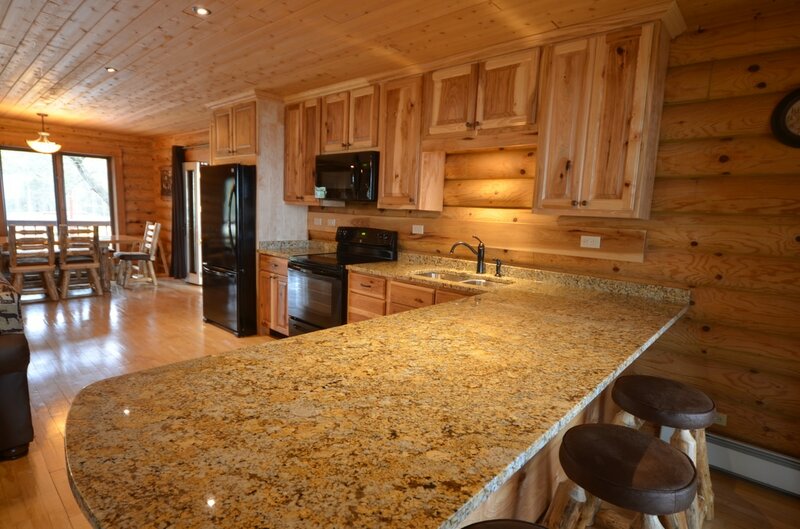 IT HAS BEAUTIFUL HICKORY CABINETS AND GRANITE COUNTER TOPS, BUT ITS BEST FEATURE IS THE BAR AT THE END THAT HAS SEATING TO OVERLOOK THE LAKE. 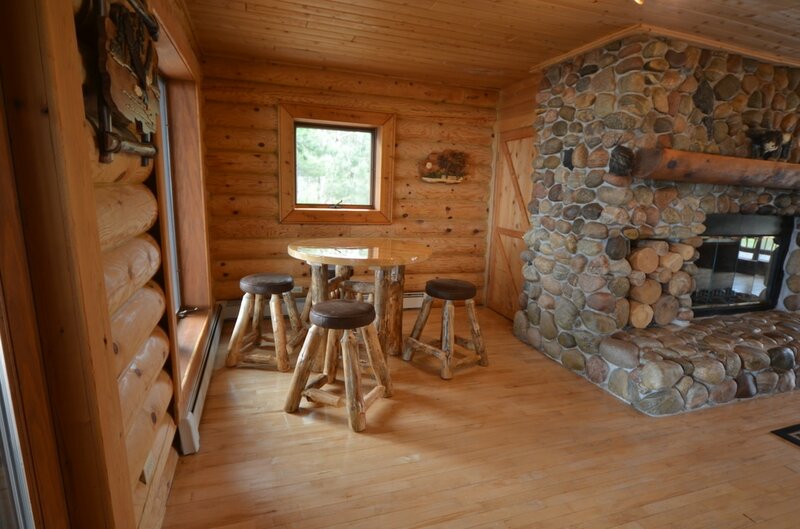 PERFECT LITTLE BREAKFAST NOOK, OR COFFEE BREAK AREA. 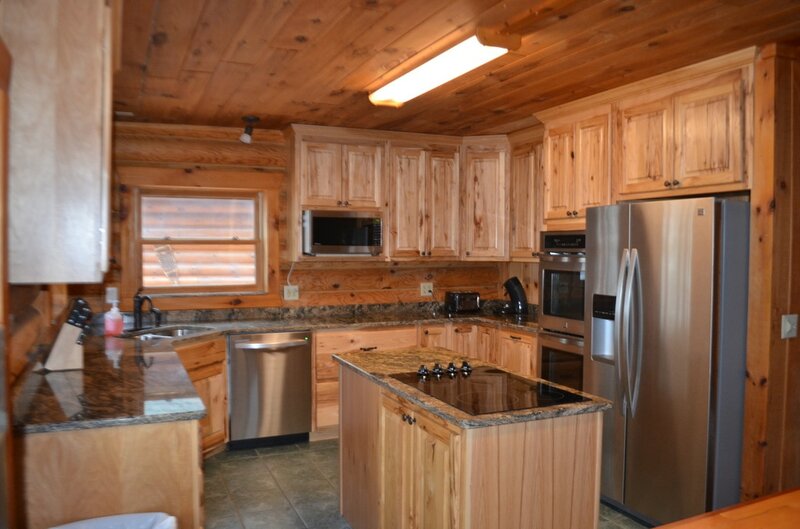 AS IS THE WEST KITCHEN, IT IS FULLY STOCKED WITH ALL NEW COOKWARE, UTENSILS, AND APPLIANCES. 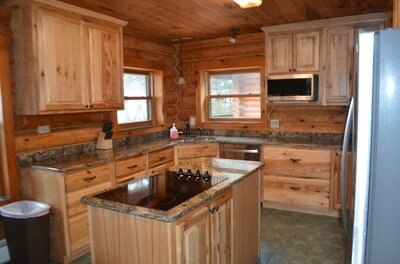 WE ALSO KEEP A SMALL SELECTION OF POPULAR SPICES AND CONDIMENTS ON HAND. BECAUSE THE LODGE ACCOMMODATES SUCH A LARGE GROUP, WE PROVIDE ADEQUATE DINING AREAS FOR EVERYONE TO ENJOY THEIR MEALS. 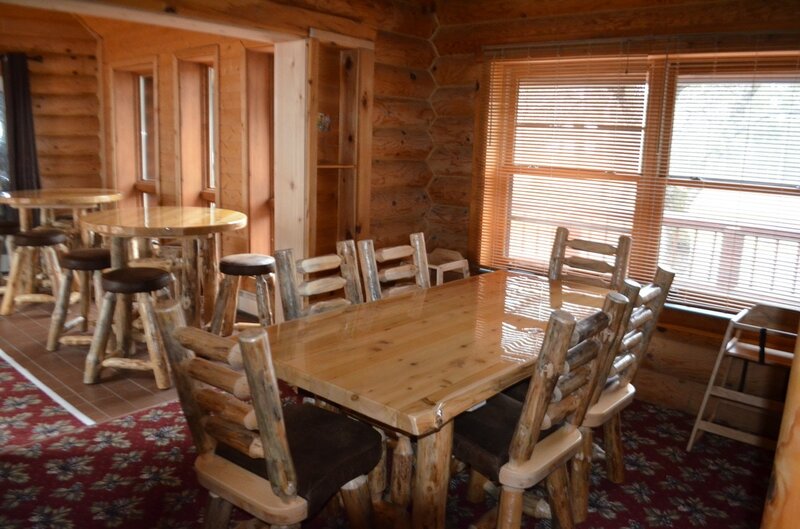 OUR FORMAL DINING ROOM LOCATED ON THE WEST SIDE OF THE LODGE IS ATTACHED TO THE ATRIUM WHICH CONNECTS THE EAST AND WEST HALF OF THE LODGE, IN THE ATRIUM WE HAVE 2 PUB STYLE TABLES THAT LOOK OUT ON BOTH THE FRONT AND BACK OF THE LODGE. 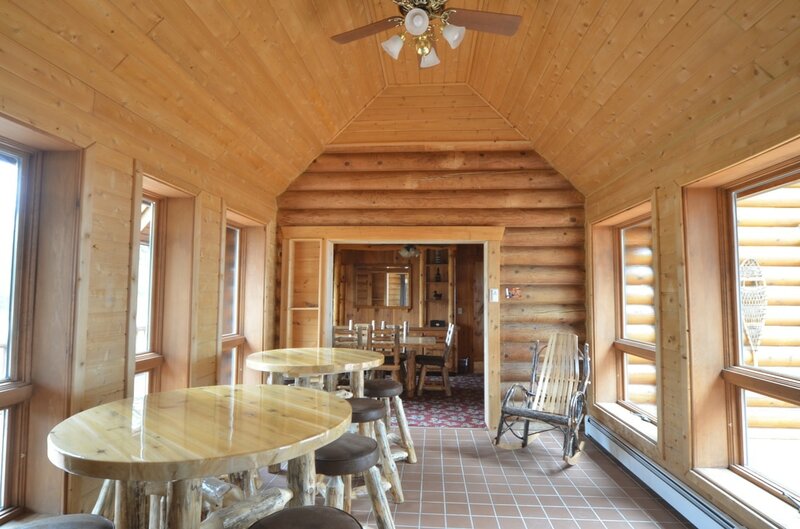 ON THE OTHER SIDE OF THE ATRIUM IS ANOTHER DINING AREA BAR SEATING IN THE KITCHENS AND PUB TABLES IN THE LAKE FACING WINDOWS. THERE IS ENOUGH SPACE FOR ALMOST 40 PEOPLE TO DINE AT THE PINEWOOD. 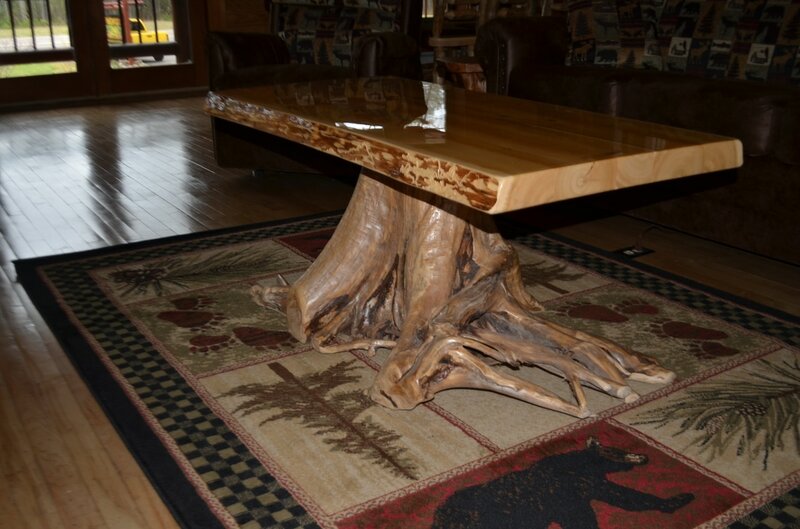 ALL TABLES ARE CUSTOM MADE LOG TABLES AND CHAIRS WITH HIGH GLOSS POLY TOPS. BEDROOM 1 HAS 1 QUEEN SIZE BED, 1 TWIN SIZE BED, A TODDLER BED AND A LARGE 3'x7' WINDOW SEAT THAT IS COZY ENOUGH TO SLEEP ON THAT OVERLOOKS LAKE SUPERIOR. 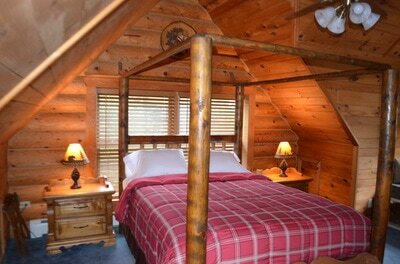 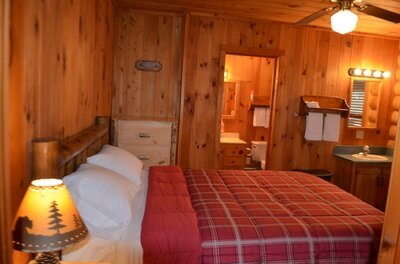 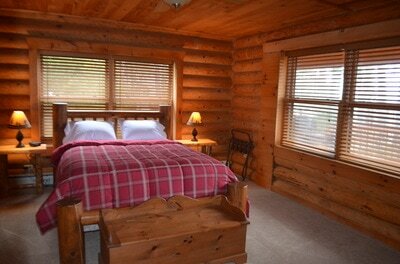 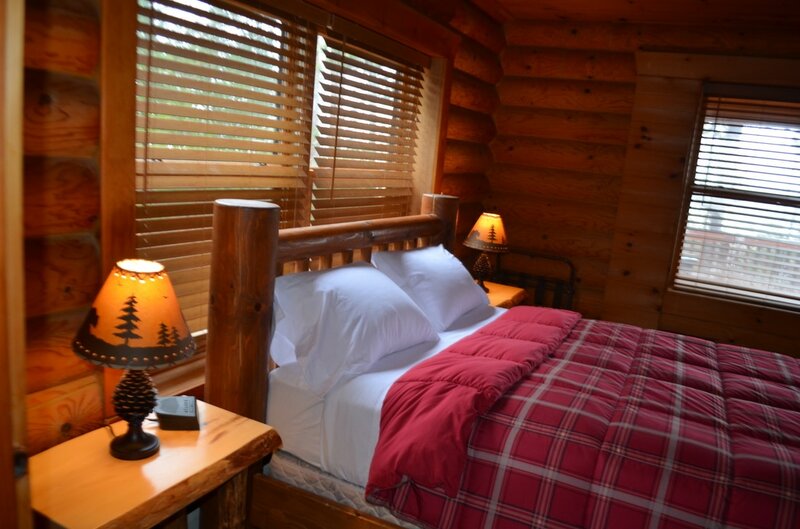 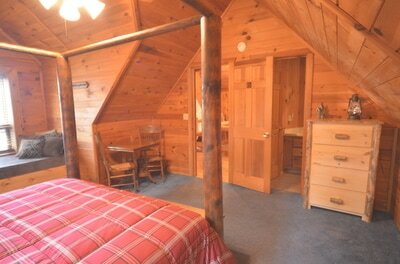 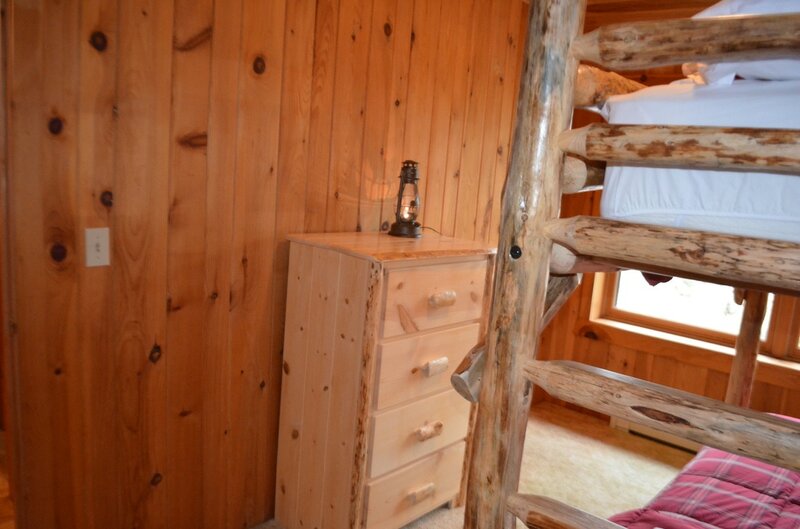 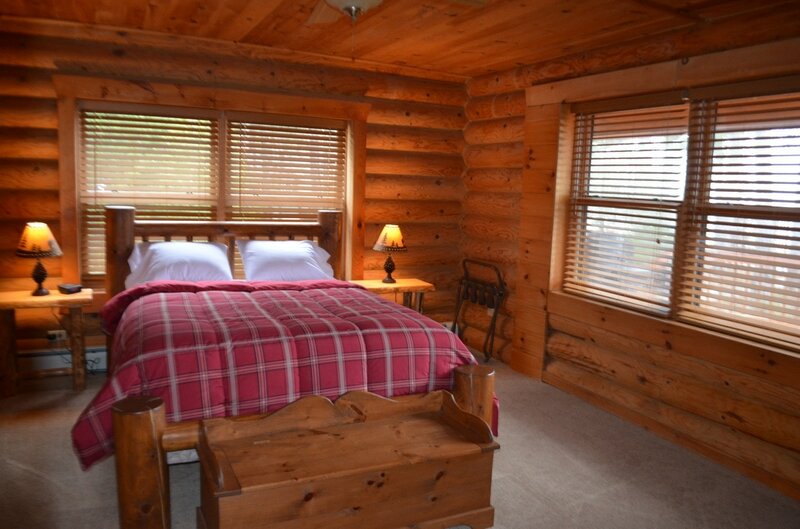 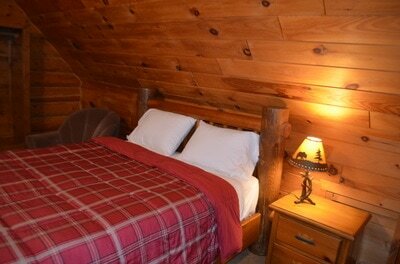 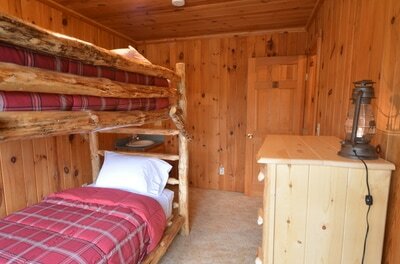 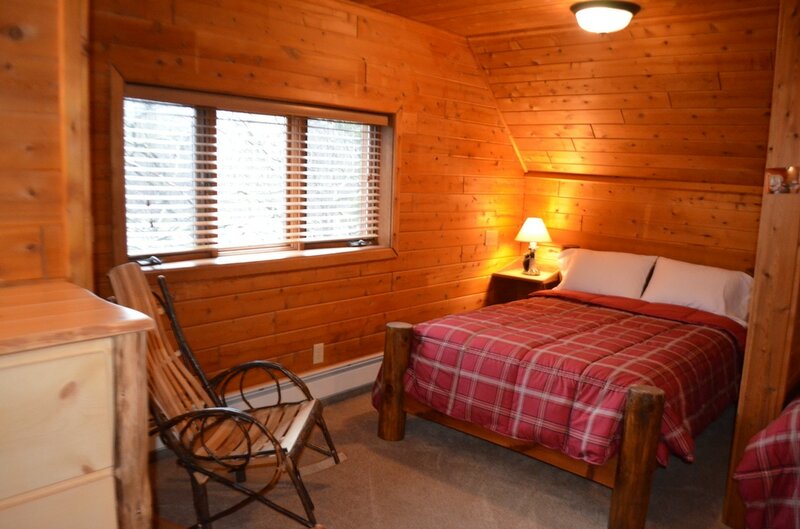 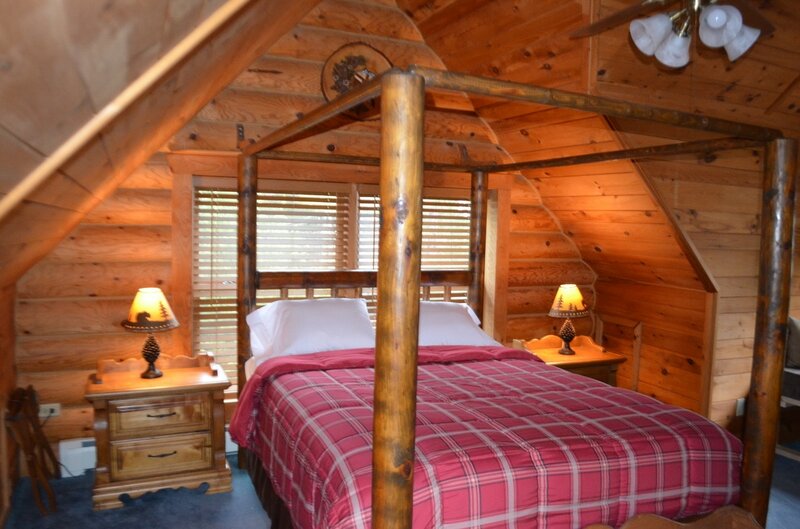 THIS BEDROOM IS LOCATED ON THE UPPER FLOOR OF THE WEST SIDE OF THE LODGE AND SHARES A FULL BATHROOM WITH BEDROOM 2. BEDROOM 2 IS LOCATED NEXT TO AND SHARES A BATHROOM WITH BEDROOM 1. 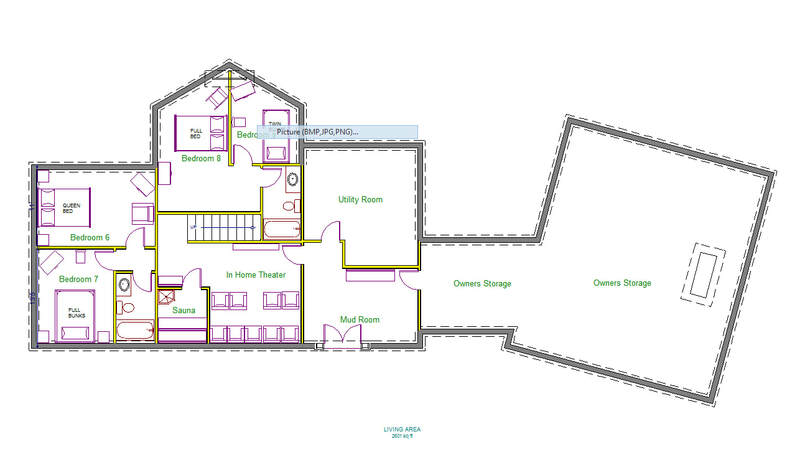 A SMALL HALLWAY AND DOOR SEPARATES BEDROOM 1 & 2 AND ARE THE PERFECT ROOMS FOR A FAMILY UP TO 6. 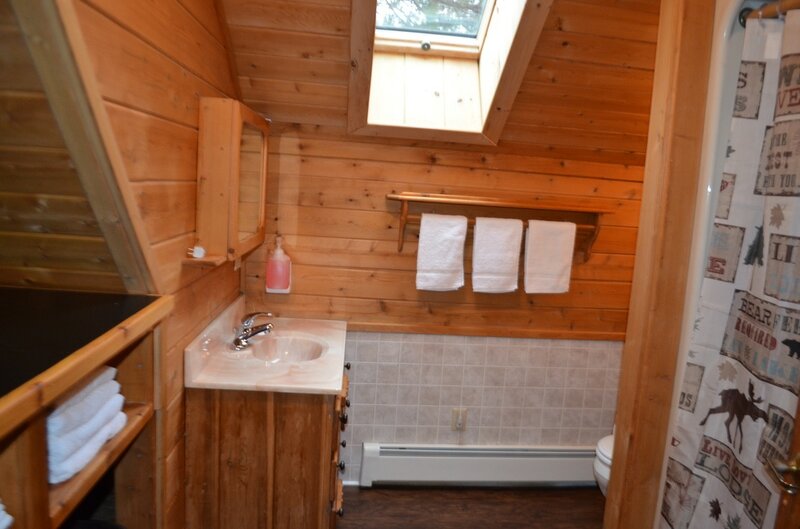 THERE IS AN ADDITIONAL SMALL VANITY/SINK IN THIS BEDROOM. 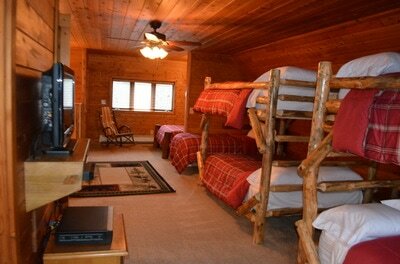 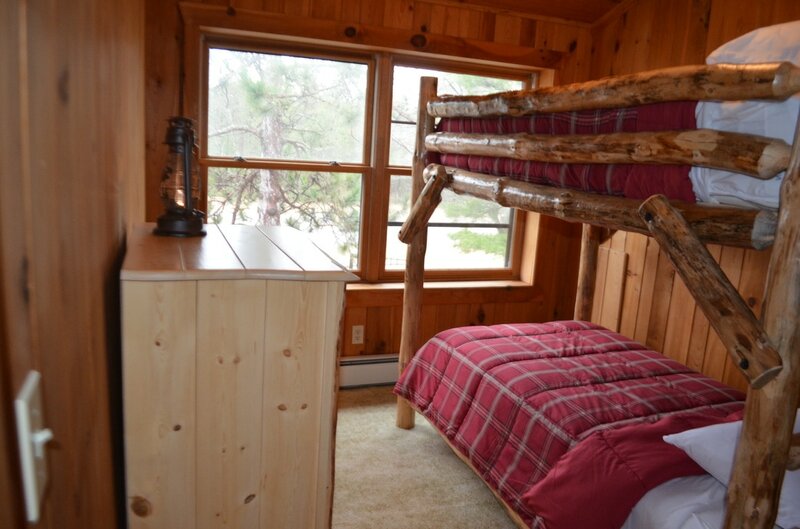 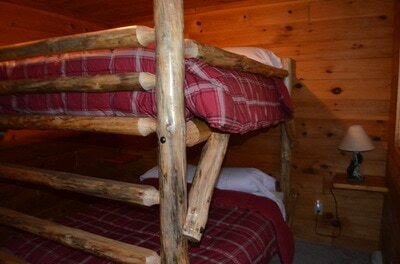 BEDROOM 3 IS ALSO LOCATED ON THE UPPER LEVEL OF THE WEST END OF THE LODGE. 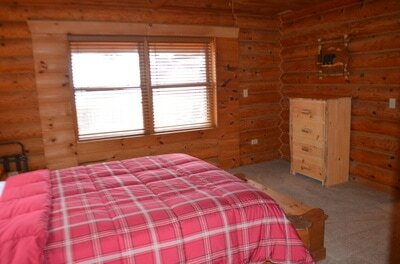 IN THIS ROOM THERE IS A QUEEN SIZE BED AND A LARGE WINDOW SEAT OVERLOOKING LAKE SUPERIOR. THIS ROOM HAS ITS OWN BATHROOM AND OUTSIDE THE BEDROOM DOOR YOU WALK OUT TO A BALCONY OVERLOOKING THE WEST GREAT ROOM. 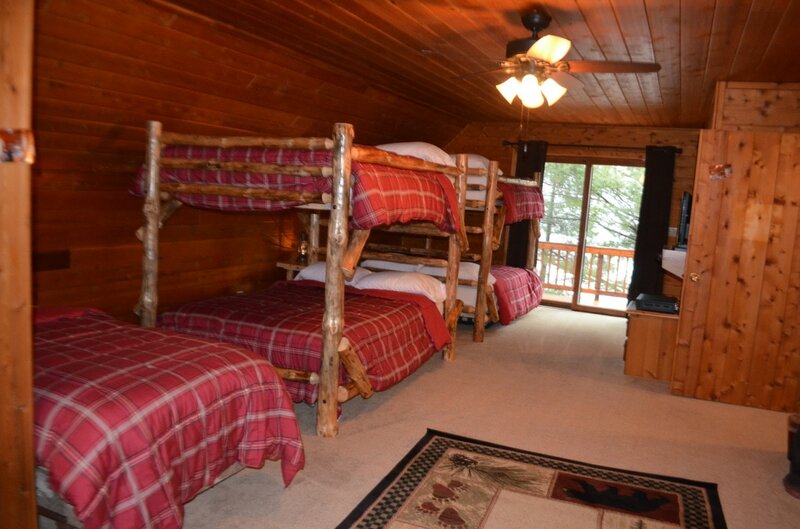 ROOM 4 IS ON THE MAIN LEVEL OF THE WEST END OF THE LODGE. 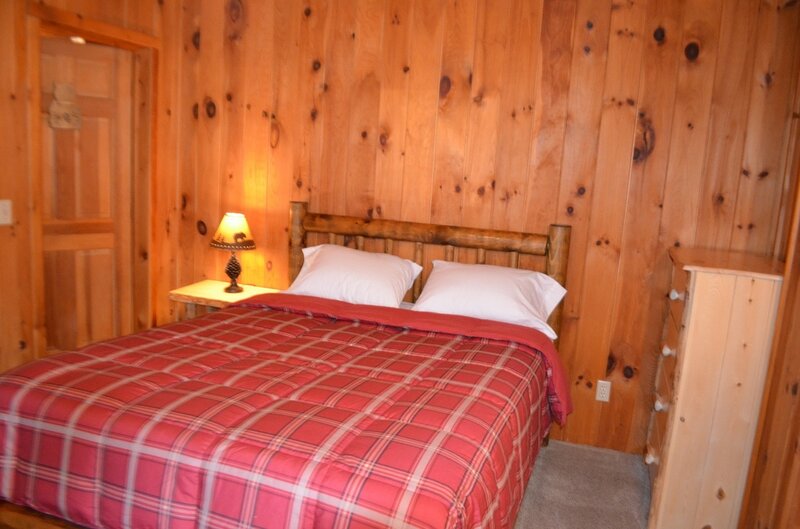 THIS ROOM HAS A QUEEN SIZE BED AND A PRIVATE BATHROOM. THERE IS ALSO A VANITY/SINK OUTSIDE OF THE BATHROOM. THIS ROOM HAS A SMALL FLAT SCREEN TV WITH DVD PLAYER BUT NO CABLE IS RUN TO THIS TV. 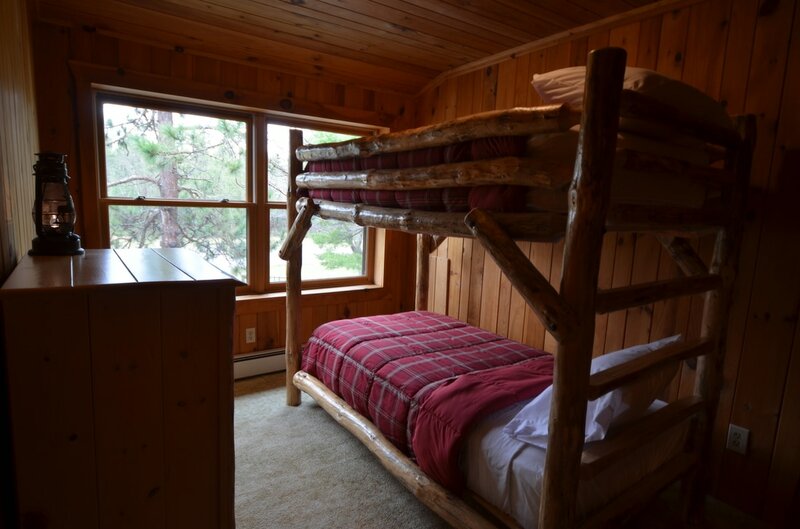 BEDROOM 5 IS LOCATED ON THE MAIN LEVEL OF THE WEST SIDE OF THE LODGE. 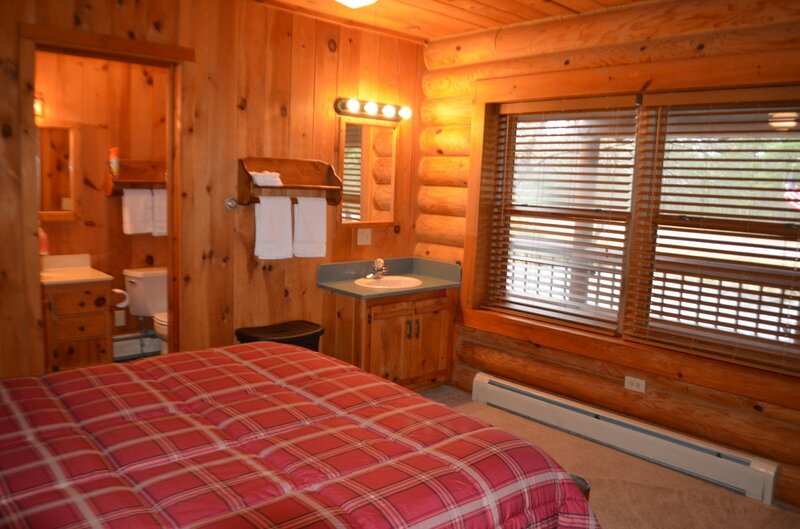 IN THIS ROOM IS A QUEEN SIZE BED, FULL LAUNDRY ROOM, AND A FULL PRIVATE BATHROOM. 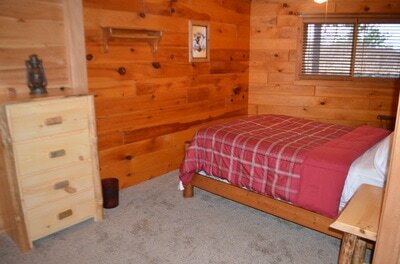 BEDROOM 8 IS LOCATED ON THE LOWER LEVEL NEAR THE SAUNA AND THE KID CAVE. 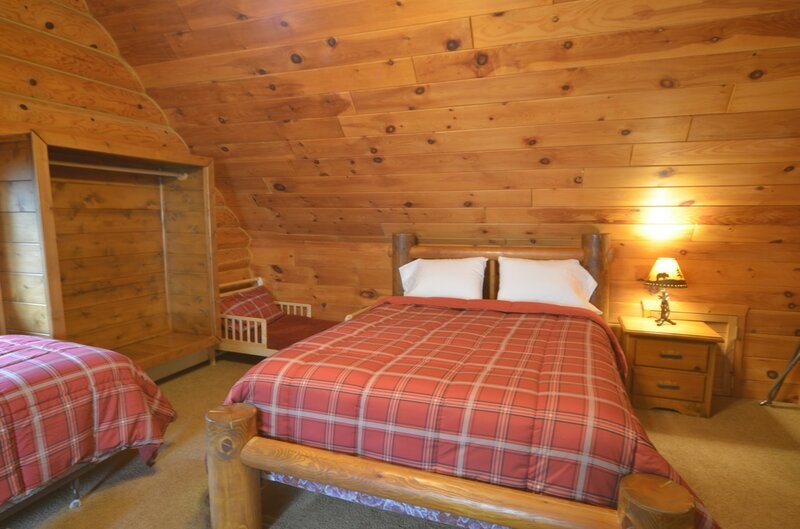 THIS BEDROOM HAS A FULL SIZE BED AND SHARES A FULL BATHROOM WITH BEDROOM 9. 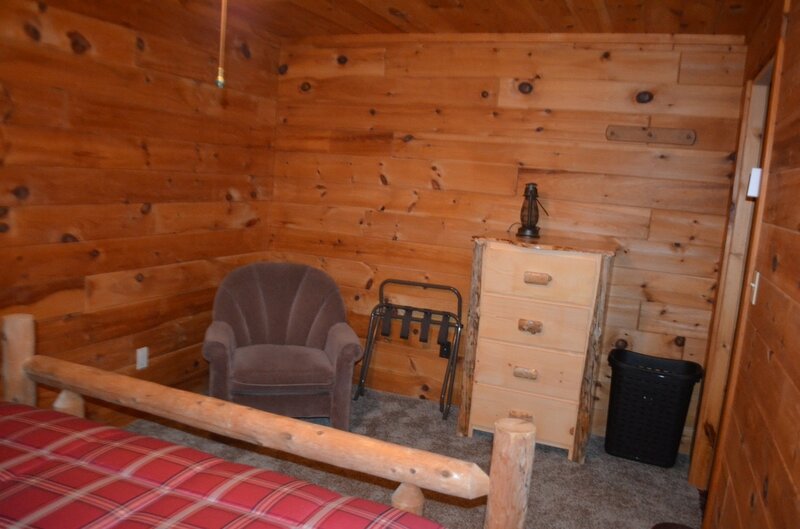 THERE IS ALSO A SMALL SITTING AREA ADJACENT TO THE BED. BEDROOM 6 IS LOCATED ON THE LOWER LEVEL NEAR THE SAUNA AND KID CAVE. 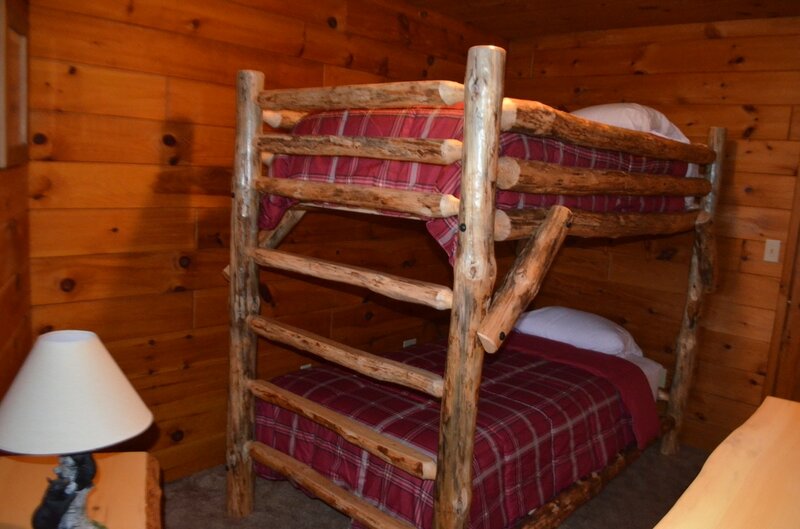 THIS ROOM HAS A FULL SIZE BUNK BED AND SHARES A FULL BATHROOM WITH ROOM 7. 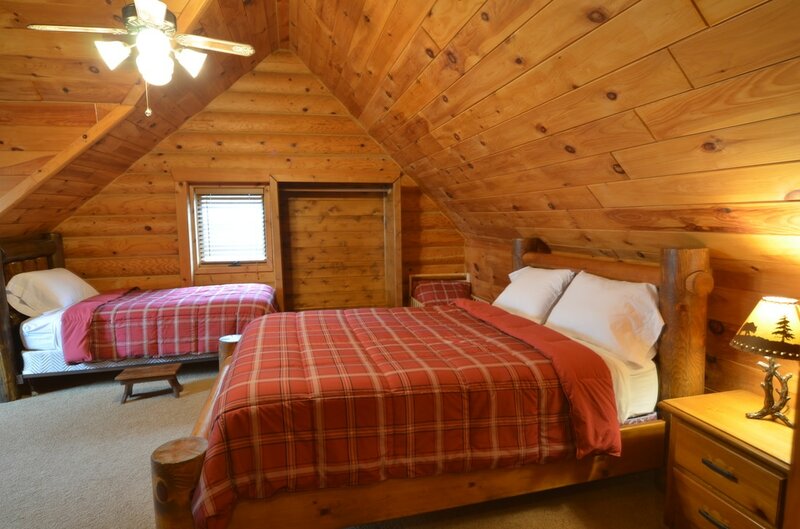 BEDROOM 10 IS THE ONLY BEDROOM LOCATED ON THE EAST SIDE OF THE LODGE. 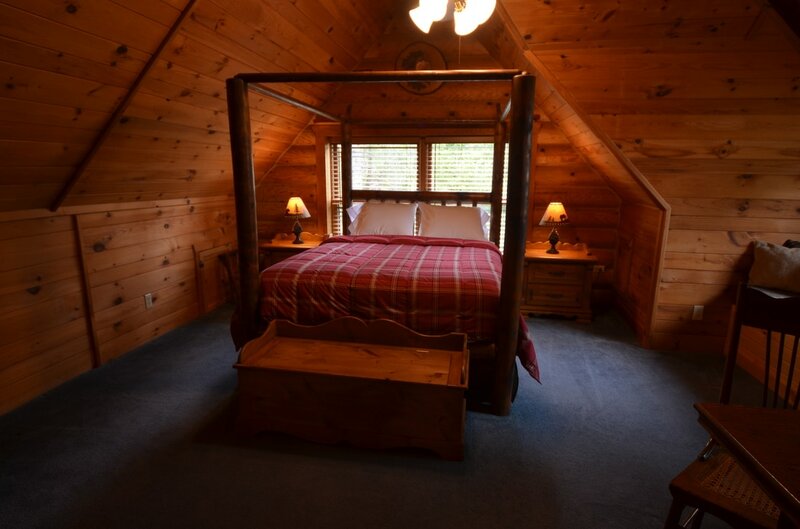 THIS BEDROOM IS ON THE UPPER LEVEL AND FEATURES A PRIVATE BALCONY THAT OVERLOOKS LAKE SUPERIOR AND THE BEAUTIFUL TRELLIS AND GAZEBO. THIS ROOM IS LARGE AND SPACIOUS AND HAS MANY FEATURES. 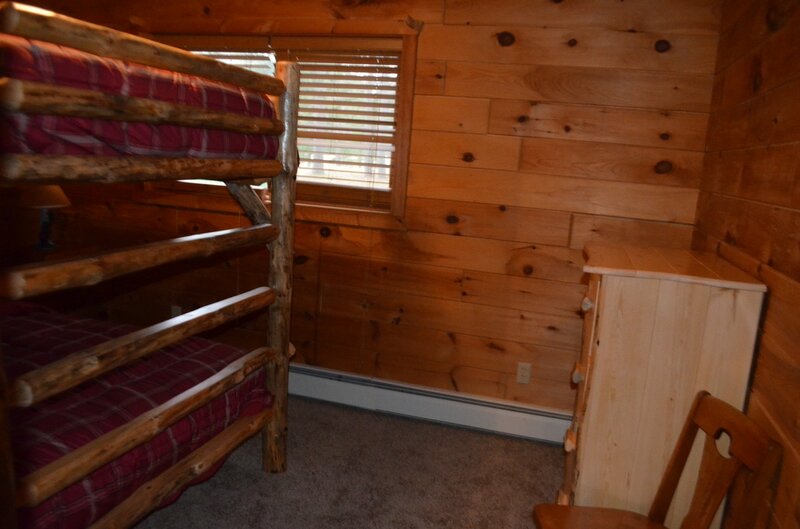 IT WILL SLEEP UP TO 11 ADULTS AND 1 TODDLER. 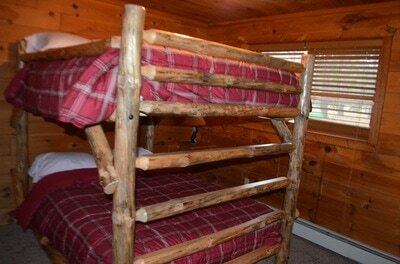 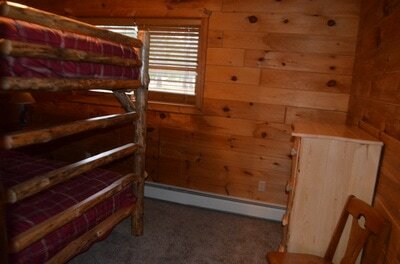 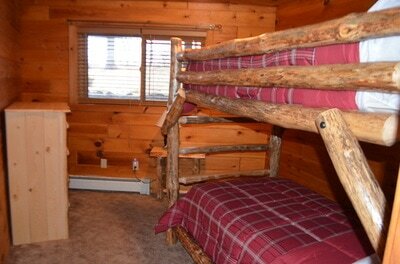 THERE IS 1 FULL SIZE BED, 2 SETS OF FULL SIZE BUNKS, A TWIN BED AND A TODDLER BED. 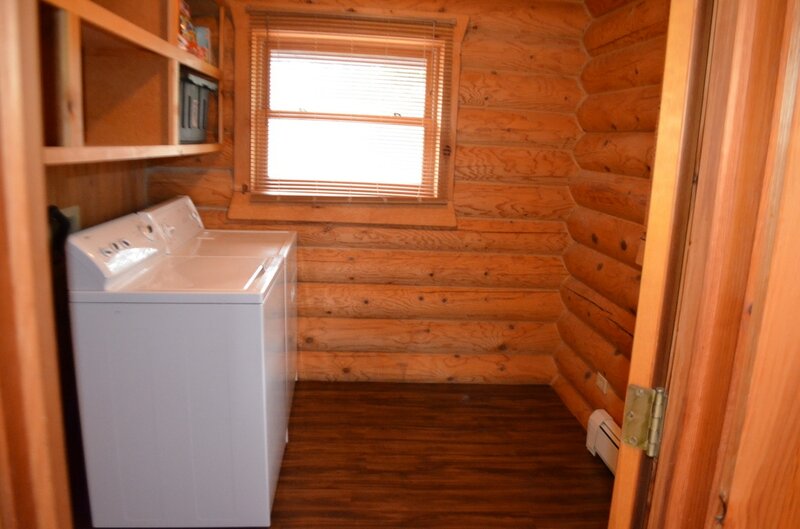 THERE IS ALSO A WET BAR WITH A MICROWAVE, A MINI FRIDGE, A FULL CLOSET, AND ALSO HAS A FLAT SCREEN TV WITH DISH TV AND DVD PLAYER. ONE OF THE WONDERFUL FEATURES OF THE PINEWOOD LODGE IS THE LARGE CEDAR SAUNA. 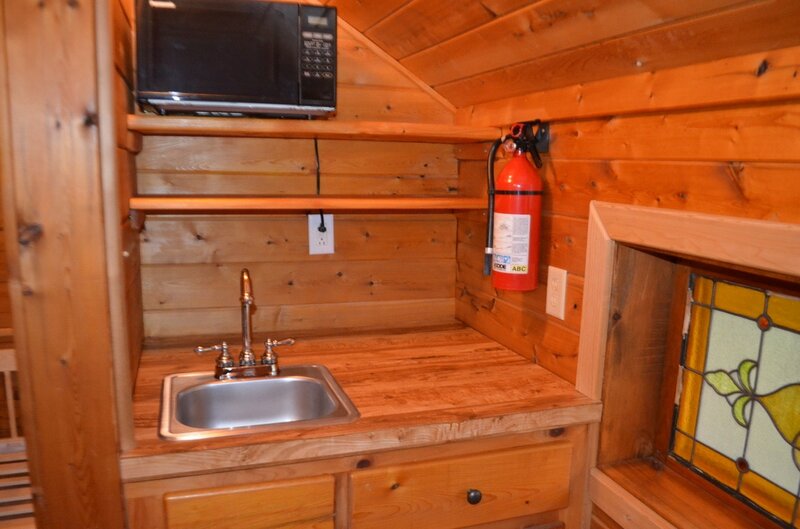 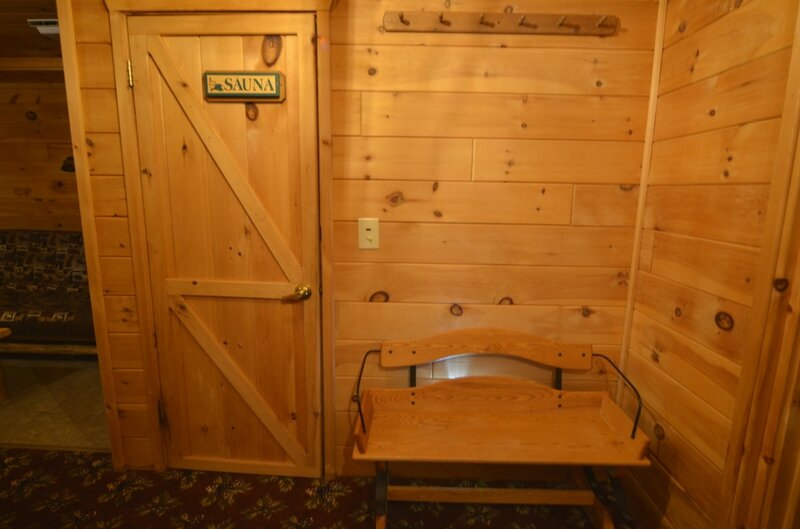 THE SAUNA IS LOCATED IN THE LOWER LEVEL OF THE WEST SIDE OF THE LODGE NEAR THE KID CAVE AND HAS A SHOWER LOCATED IN SIDE. 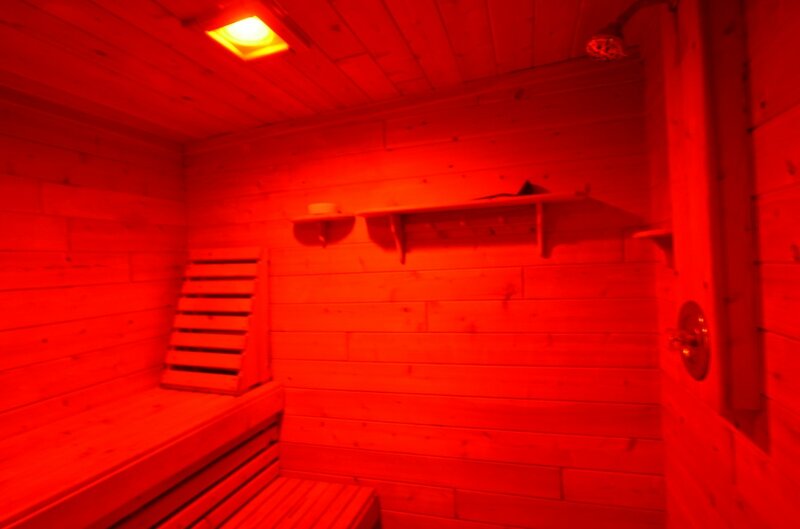 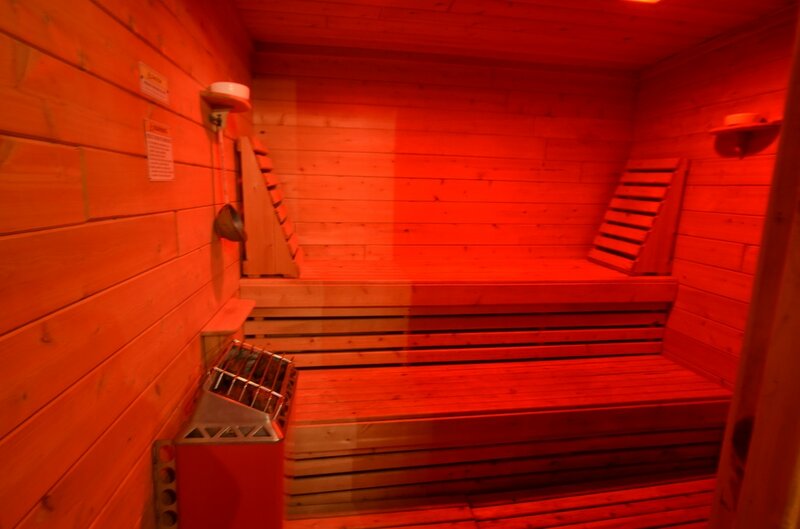 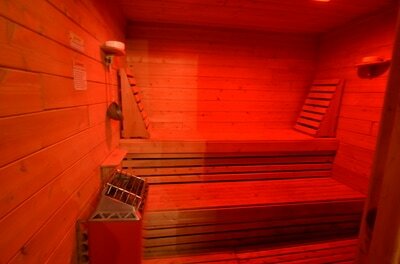 THIS SAUNA IS A 6-8 PERSON CAPACITY AND IS A GREAT WAY TO END AN EXHAUSTING DAY OF ACTIVITIES. 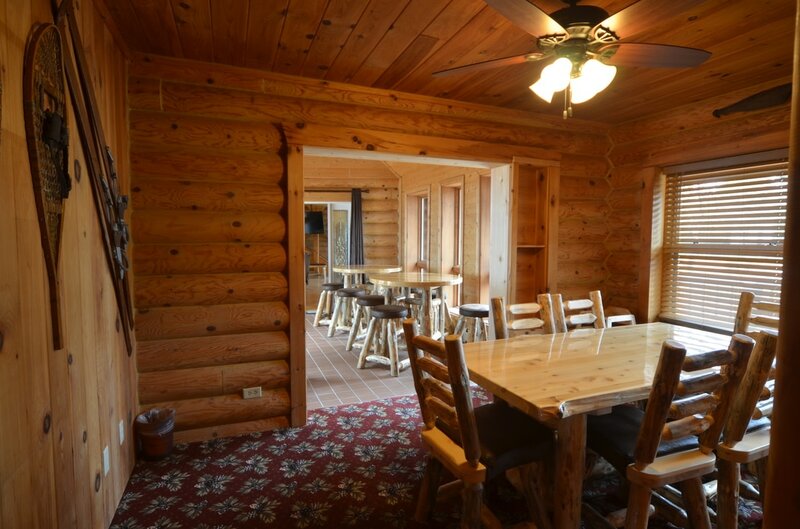 WE KNOW THAT WHEN YOU ARE PLANING FOR A LARGE GROUP WITH MULTIPLE FAMILIES THAT IS IMPORTANT TO FIGURE OUT THE BEST WAY TO ACCOMODATE EVERYONE. 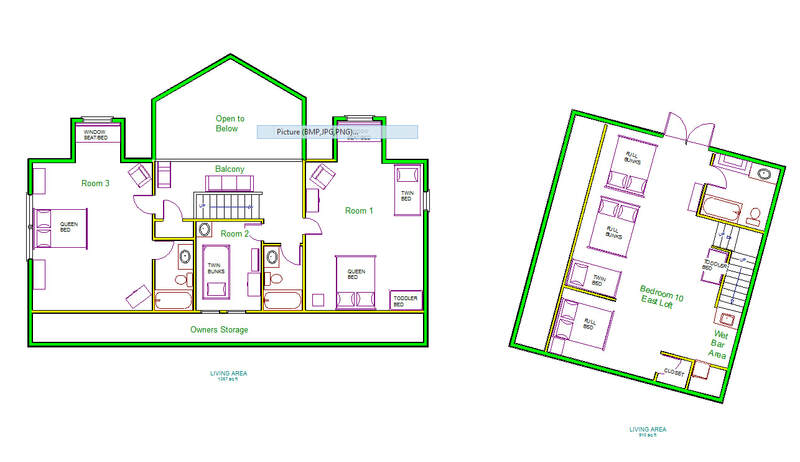 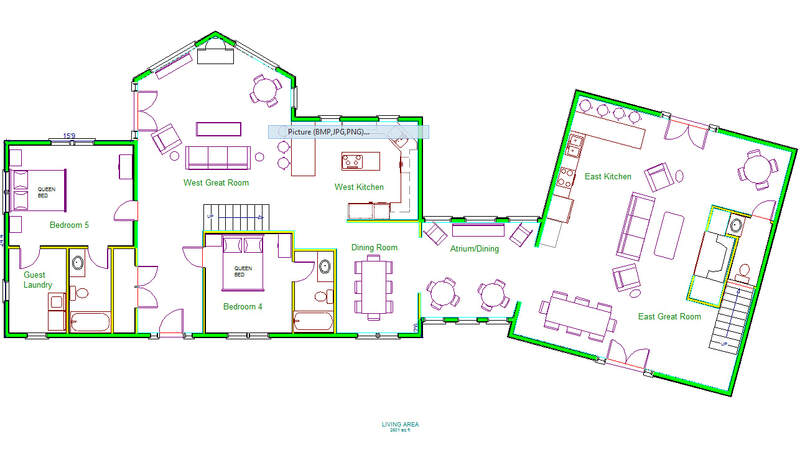 TO HELP WITH THAT PROCESS, WE MADE UP SOME SIMPLE FLOOR PLANS WITH BEDROOM NUMBERS AND BED SIZES.